German trio Eat the Gun are no strangers to the rigors of rock'n'roll, as this experienced troupe has some impressive tours and a few albums under their belt in their native land from nearly a decade in the scene. The squad’s latest affair, "Runner," is their attempt to take the rest of the rock universe by storm and spread their simple yet effective rock to the masses. This 11-track disc interjects a mountain of muscle into their slightly sleazy but thankfully rarely cheesy sound, with an arsenal of no-frills riffs and a powerful percussive presence at the forefront. 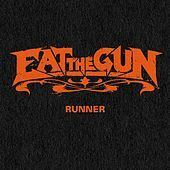 Eat the Gun showcases a barrage of contagious hooks with distinguishable roots in the hair metal era (“I Am Obsessed”, “365”), parlaying an approach chock full of rousing tunes that gets the blood pumping (“Not Dead Yet”). For more information, check out http://www.eatthegun.com.